There are many versions of biryani (pilaf) in India, but the biryani recipe from Hyderabad ranks on the top! The recipe which became popular under Nizam rule, has been passed down for centuries. The biryani recipe involves many steps – preparing the biryani spice mix, rice, making the vegetable or meat gravy, assembling and layering and finally ‘dum cooking’ for 25 minutes. We at 24 Mantra now bring you this authentic recipe from Hyderabad, which can be ready in 15 minutes! 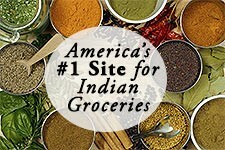 The all natural spice mix blended with basmati rice, will delight the taste buds of your family! 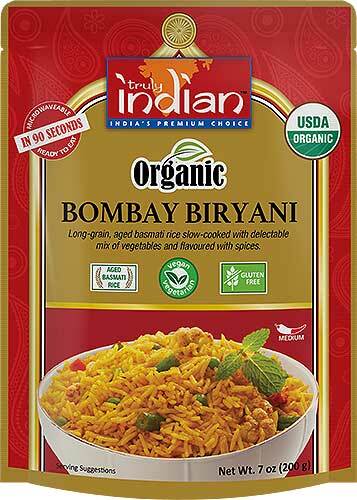 Made with organic ingredients, no additives or preservatives added, this biryani will make any menu richer! Combine one measure of mix with one measure water. STEAM: Steam this in an electric cooker or idly cooker for 15 min. DO NOT PRESSURE COOK. 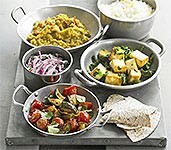 SERVE: Remove from heat and serve hot with raita. Combine one measure of mix with 2 measures of water. 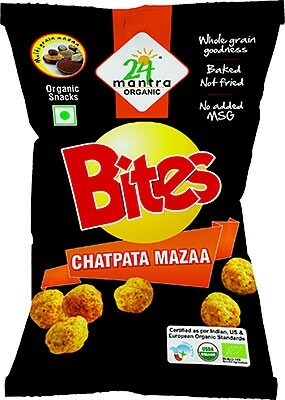 24 Mantra Organic Bites Chatpata Mazaa is a lip smacking snack made with 5 organic grains - rice, corn, whole wheat, jowar and ragi. It is naturally flavored with authentic spices. They are baked and not fried. 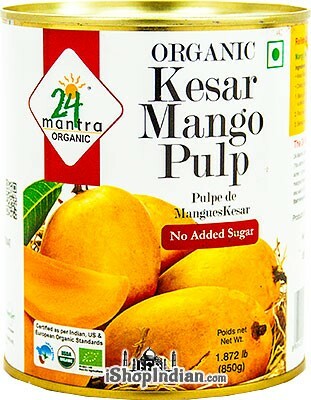 Ingredients: Multigrains* (66.5%) (Rice, Corn, Whole Wheat, Jowar, Ragi), peanut oil*, sugar*, salt, mango juice powder*, chili powder*, spices*, acidulant (citric acid), antioxidant (mixed tocopherol). Ingredients with * are organic. 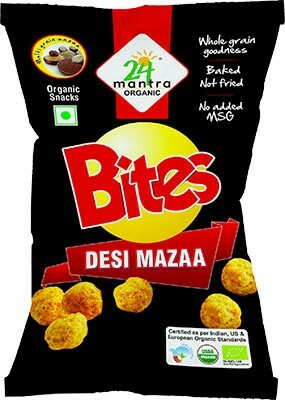 24 Mantra Organic Bites Desi Mazza is a lip smacking snack made with 5 organic grains - rice, corn, whole wheat, jowar and ragi. It is naturally flavored with authentic spices. They are baked and not fried. 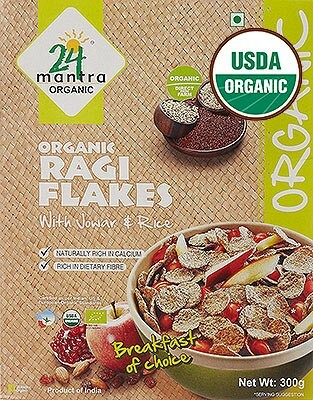 Ingredients: Multigrains (66.5%) (Rice, Corn, Whole Wheat, Jowar, Ragi), peanut oil, sugar, salt, spices (chili powder, cumin powder, coriander powder), onion powder, garlic powder, citric acid, antioxidant (mixed tocopherols), asafoetida. 24 Mantra Organic Bites Pizza Mazaa is a lip smacking snack made with 5 organic grains - rice, corn, whole wheat, jowar and ragi. It is naturally flavored with authentic spices. They are baked and not fried. 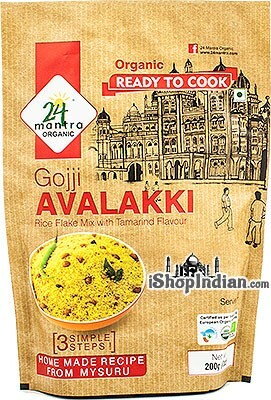 Ingredients: Multigrains* (66.5%) (Rice, Corn, Whole Wheat, Jowar, Ragi), peanut oil*, sugar*, salt, cheese powder, tomato powder, onion powder*, garlic powder*, chili powder*, spices and herbs*, acidulant (citric acid), antioxidant (mixed tocopherol). Ingredients with * are organic. A light and tasty dish from Karnataka, delicately flavoured with tamarind and spices, ready in minutes It is made with organic ingredients and no preservatives added! What more could you ask for? MIX: Take one measure of mix in a bowl. Stir in 1 measure of boiling water. 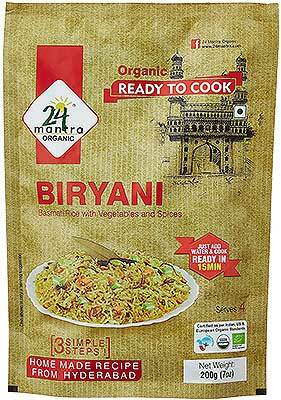 Ingredients: *Rice flakes, *Peanuts, *Peanut oil, *Sugar, *Tamarind Paste (*Tamarind, water, salt), Salt, *Split Bengal gram, *Coriander, *Red Chilli (1.4 %), *cane juice powder, *Mustard, *Curry leaves, *Cumin, Desiccated Coconut powder, *Split Pigeon Pea, *Split Black gram, *Fenugreek, *Sesame, *Black Pepper, *Turmeric, Asafoetida. Ingredients with * are organic. An organic traditional Indian snack made with roasted organic peanuts, jaggery (unrefined sugar), organic sugar and organic cardamom. These peanuts have a mellow, brown sugar flavor with accents of cardamom. This is a roasted product, and not fried, and contains no cooking oils. Ingredients: organic peanut, organic jaggery, organic sugar, organic cardamom. Comes conveniently packaged in a resealable pouch. 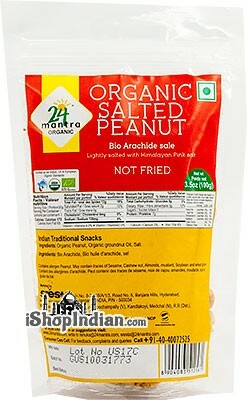 An organic traditional Indian snack made by roasting organic peanuts with hot and tingling spices. These peanuts have a piquant and tangy flavor. This is a roasted product, and not fried. 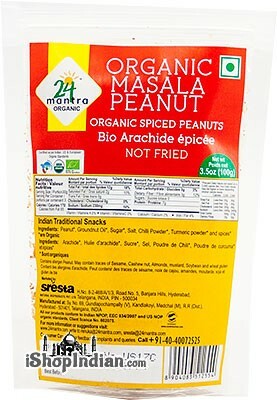 Ingredients: peanuts*, groundnut (peanut) oil*, sugar*, salt, chili powder*, turmeric powder*, and spices*. *are organic. Enjoy this power-packed Multigrain flakes cereal with the wholesome goodness of whole wheat, corn, rice, juwar (sorghum) and Amaranth. -Sugar - Only 3 gms of sugar per serving. 24 Mantra Organic Peanut bars are made of Peanut, evaporated cane juice and sugar only. No liquid glucose or corn syrup is used. Contains 3.3 gm protein per bar. INGREDIENTS: Organic Peanut, Organic evaporated cane juice and Organic sugar. 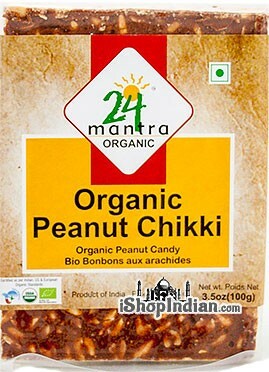 Traditional Indian peanut candy made from the finest sorted organic peanuts and organic cane sweeteners. 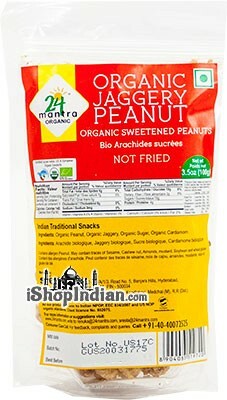 Ingredients: organic peanuts, organic jaggery (evaporated cane sugar), organic sugar. Quinoa is a super grain and has been grown in Latin America for thousands of years. It is naturally rich in fibre and contains essential nutrients like omega-3, iron and zinc. Quinoa is an ideal grain for organic cultivation and grows well in Indian soil and climatic condition. 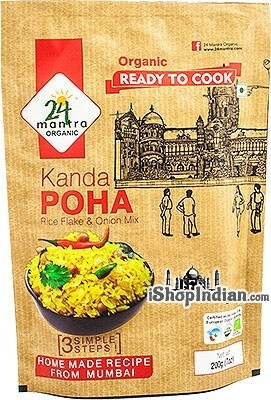 At 24 Mantra they decided to use this super grain to make the world's favorite dish - pilaf. 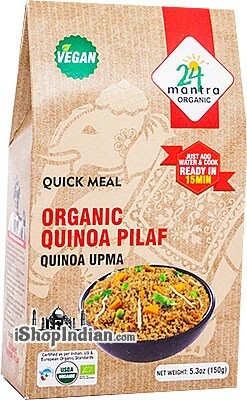 It is given a healthy twist by blending quinoa with Indian seasonings. Simply Stovetop and Microwave instructions provided on the pack. 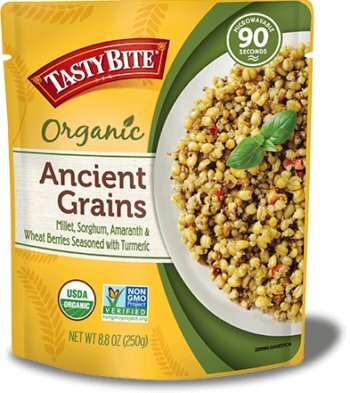 Ingredients: quinoa*, safflower oil*, dried onion*, dried vegetables* (carrots, beans), split bengal gram*, split black gram*, salt, sugar*, mustard*, dried curry leaves*, chili powder*, turmeric*, spices*, mixed tocopherols and asafoetida. Ingredients with * are organic. 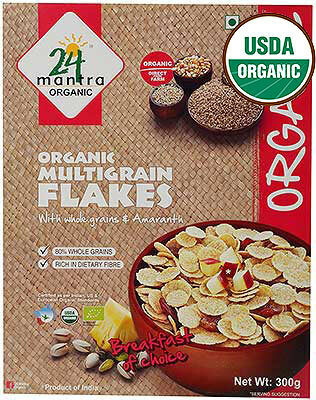 A traditional breakfast now goes organic! Made with ragi, naturally rich in calcium, these idlis are healthy, easy to make and great to taste! No preservatives added. What more could you ask for? 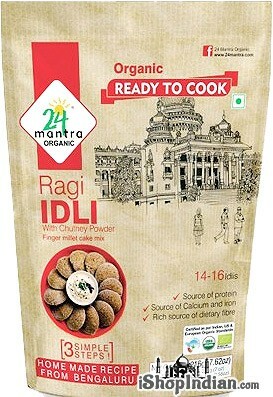 MIX: Empty contants of Ragi idli mix pack into a bowl and add 1 1/2 cups* measures of water (360 ml). Mix to make a smooth batter without lumps. REST: Set aside for 30 minutes. Chutney powder – Mix chutney powder with sesame oil and eat with hot ragi idlis! 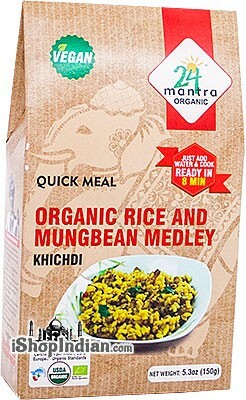 Rice and Mungbean Medley known as Khichdi in India is often described as "Soul Food." This recipe blends whole green gram, which is rich in dietary fibre and protein with rice and mild spices to give your family a tasty and nutritious meal. Now enjoy this all-time comfort food from 24 Mantra in minutes! 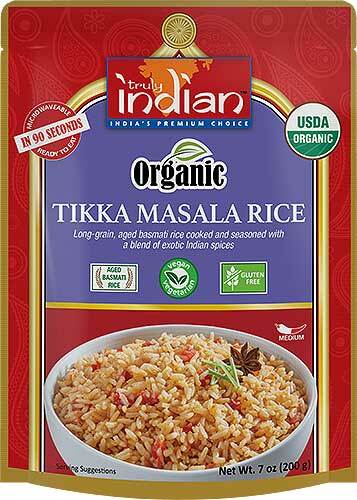 With no preservatives or additives added, you will have the pleasure of feeding your family this popular dish from India the organic way! Easy to follow stovetop or microwave cooking instructions provided on the box. 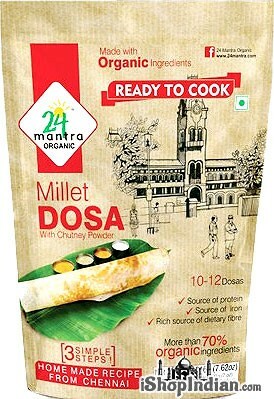 Ingredients: Rice*, Mungbean* (green gram), safflower oil*, rice flour*, split green gram flour*, cumin*, salt, turmeric*, mixed tocopherols and asafoetida. Ingredients with * are Organic. Roasted, organic black chickpeas with a hint of salt. 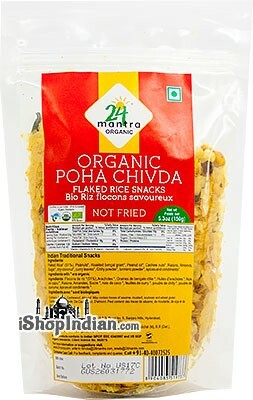 Healthy and filling snack to for daytime munching. 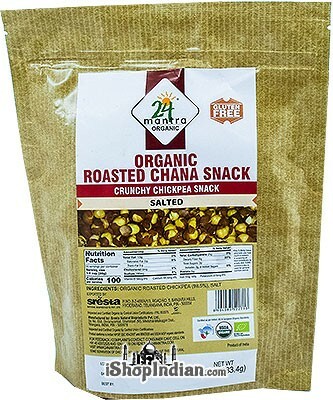 Ingredients: organic roasted chickpea (98.5%), salt. Lightly salted peanuts made with Himalayan Pink salt. Resealable bag for handy use. 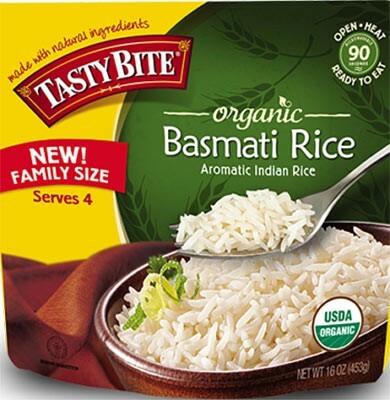 Long-grain, aged Basmati rice cooked and seasoned with a blend of exotic Indian spices. Ready to eat in 2 minutes - Just cut the pouch and microwave. Ingredients: *basmati rice, water, *tomatoes, *onions, *sunflower oil, *coconut milk, *green bell peppers, salt, *garlic, *ginger, *cashewnuts, *melon seeds, *sugar, *red chilies, *spices (sesame), *coriander, *cumin, *corn flour, *chili powder, *coriander leaves, *five spice powder, paprika oleoresin, citric acid. 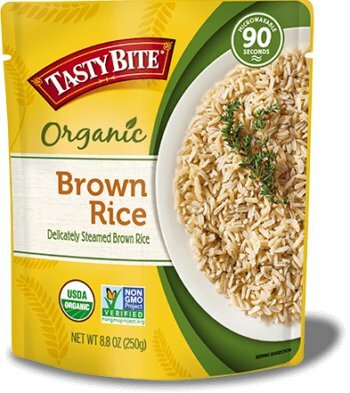 Ingredients with * are Certified Organic. Processed in a facility that also processes milk. 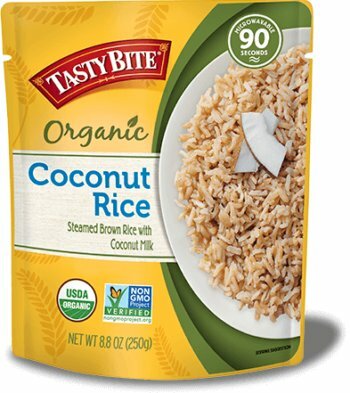 Long-grain, Aged Basmati rice infused with the richness of coconut milk. 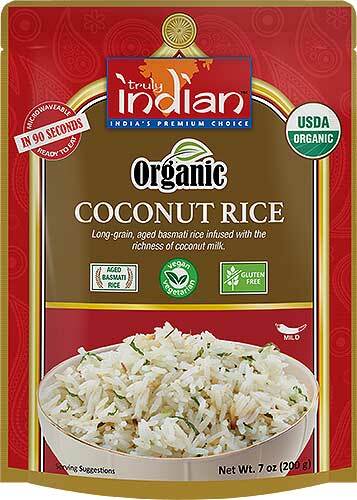 INGREDIENTS: *Basmati Rice, Water, *Coconut milk, *Onion, *coconut oil, *Garlic, Salt, *Ginger, Citric Acid, *Green Chilli. Ingredients with * are Certified Organic. Processed in a facility that also processes milk, tree nuts & sesame.